Serena Williams has teamed up with OPI to make a Grand Slam Nail Polish Duo. You put the green or the base color down first and once its finished drying you apply the black shatter which then begins to shatter off leaving a rustic crumpled look on your fingers. Its WAY too cute to pass up! Something looks different about Serena, not sure what it is but one thing is sure her overall appearance looks polished and put together. Hair, make-up, cloths, shoes, all on point. This is a pic of Serena at Michael Kors @ fashion week. 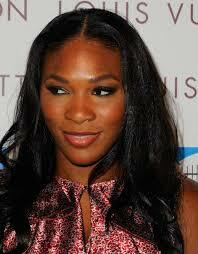 Looking good Serena, keep it up!